There are so many recipes that can be made using ragi like ragi dosa, ragi roti, ragi balls, ragi poori, ragi rotti, ragi uttappam etc. 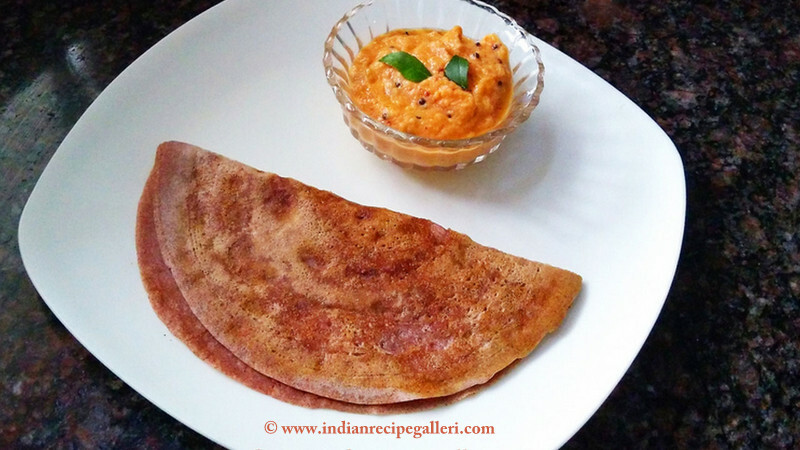 Ragi dosa is quite easy to prepare and very tasty too. It is quite apt for busy mornings and is a healthy lunch box option too. If you are looking for more breakfast recipes, do check these out -- Dosa, Pesarattu dosa, idli, Instant oats paniyaram, Coconut sevai, Semiya upma. Wash and soak rice and urad dal for 2-3 hours. Then grind them well until smooth. To this ground batter add 1 cup of ragi flour, salt and 1/2 cup water and grind once again. No fermentation of this batter is required and it can be used immediately. The consistency of the batter should be like normal dosa batter. Take a ladle of batter, pour it in the centre and spread it around in a circular motion using the back of the ladle like we normally do for dosa. DO NOT spread it too thin like a paper dosa.